The system sounds the alarm and flashes the lights when forced entry is detected. ● The hood is opened. ● The battery is reconnected. Close the doors and hood, and lock all the doors. The system will be set automatically after 30 seconds. The indicator light changes from being on to flashing when the system is set. The vehicle has a maintenance-free type alarm system. 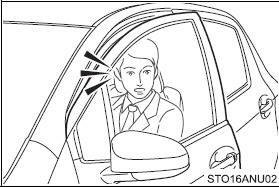 ●Nobody is in the vehicle. ●The windows are closed before the alarm is set. ●No valuables or other personal items are left in the vehicle. 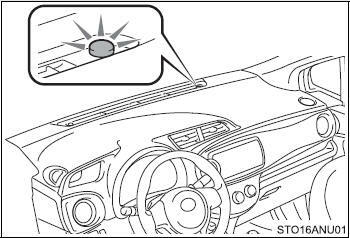 ●A person inside the vehicle opens a door or hood. 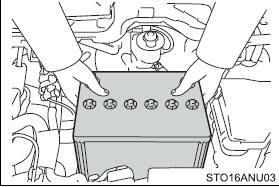 ●The battery is recharged or replaced when the vehicle is locked. Be sure to cancel the alarm system. If the battery is disconnected before canceling the alarm, the system may be triggered when the battery is reconnected. ●When the alarm is operating, the doors are locked automatically to prevent intruders. ●Do not leave the key inside the vehicle when the alarm is operating, and make sure the key is not inside the vehicle when recharging or replacing the battery.